A Workshop with several group of students (age 16-18) reveals that adolescents would rather receive informed consent through social media and audiovisual material than in a traditional way. Social media appears to be the most popular solution to improve informed consent. 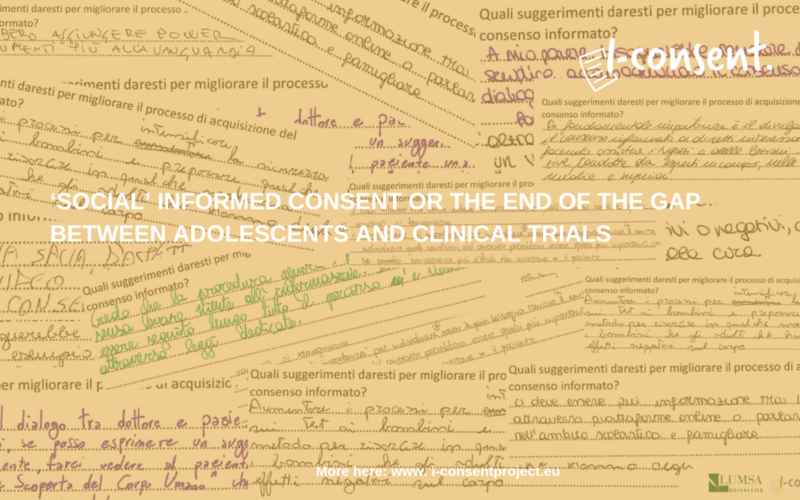 At least that’s what most students suggested during the i-CONSENT presentations organized by LUMSA i-CONSENT team as one of the complementary activities during the European Research Night (Rome, 28th September 2018). Students had the opportunity to see by an animated video what a clinical trial process looked like, the implications it had, its importance for society and the ethical challenges at stake. Then, through an anonymous questionnaire they were able to share their opinion on how informed consent is currently collected by researchers and subjects. Social Media happened to be, once again, the students favourite. Of course, these are platforms they are familiar with and use on a daily basis, if they could be adapted to offer the necessary information to participate in a clinical trial, we would be killing two birds with one stone. Information would be more attractive and appealing to this target group and their acceptance would probably be higher. Another point raised by students was the possibility to use audiovisual content and dynamic information: videos, applications, TV, games, puzzles, comics or interactive and fun activities. In short, offering personalized information presentation according the cultural and age level of the patient/potential participant and seeking the highest level of comprehension. But what is sure is that none of them would leave informed consent as it is, as a long tedious document difficult to understand. Informed consent needs an update. The attendees also suggested that a good solution would be to inform society, from an early stage of what a clinical trial is and treat this branch of research as a normal activity. Lectures at schools on informed consent and clinical trials or guided tour around laboratories are some of the suggestions made by them. All in all, simplifying the processes and increasing the researcher-participant dialogue to promote trust between them, taking advantage of the opportunities that IC offer, was the general conclusion the students came up with. Is the end of the gap between adolescents and clinical trials a bit closer? i-CONSENT project is working on it.